The effect of human placenta extract in a wound healing model. Hong JW, Lee WJ, Hahn SB, Kim BJ, Lew DH. Yonsei University, Department of Plastic and Reconstructive Surgery, Institute for Human Tissue Restoration, Seoul, Korea. 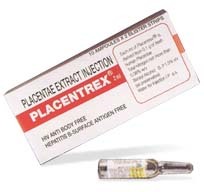 Human placenta had been used on wound healing such as burns, chronic ulcers, and skin defects. Recently, human placenta has been widely used in the form of human placental extracts (HPE) by clinical field. However, it is unclear what the effect of HPE is on wound healing. We studied the effect and mechanism of HPE on wound healing.In this study, 10 mice (imprinting control region mice, 5 week old males, 30 g) were divided into an experimental group and a control group. An 8-mm diameter single full-thickness skin defect was made on the back by skin punch biopsy. At least 2.0 x 10 mL/30 g HPE was injected into the boundaries of the wound. Wound size measurements were taken by digital image every 3 days over 2 weeks. Hematoxylin and eosin (H and E), transforming growth factor beta (TGF-beta), vascular endothelial growth factor (VEGF), and CD31+ immunohistochemical stains were performed on the 6th and 14th day.The experimental group showed acceleration in the decrease of wound size compared with the control group from the third day to the ninth day. TGF-beta on the 6th day showed a statistically significant increase in the experimental group. VEGF on the 14th day showed a statistically significant increase in the experimental group. CD31+ was increased in the experimental group as wound healing progressed, but this increase was not statistically significant. The total number of vessels increased in the experimental group, but this was not statistically significant.We conclude that administering HPE directly to a wound margin promoted wound healing. This mechanism appears to be related to an increase in TGF-beta in the early phase of wound healing and VEGF in the late phase. A human placental extract: in vivo and in vitro assessments of its melanocyte growth and pigment-inducing activities. Pal P, Mallick S, Mandal SK, Das M, Dutta AK, Datta PK, Bera R, Bhadra R.
Cellular Biochemistry Laboratory, Indian Institute of Chemical Biology, Dermatology Section, Institute of Child Health, Calcutta, India. The authenticity of various prototype human placental extracts with biological activity, such as that inducing vitiligo repigmentation, is under serious criticism, mainly due to a lack of demonstration at the cellular level. Considering the present worldwide scenario with regard to the occurrence and treatment of vitiligo, a thorough scientific exploration of such extracts should be undertaken. One such prototype placental preparation was prepared, and was evaluated with regard to its melanogenic action in C57BL/6J mice in vivo and its mitogenic and melanogenic activity on B16F10 mouse melanoma cells and normal human melanocytes in vitro. The extract was applied topically to mice with age-induced prolonged telogenic phase of hair growth (grey body coat hair). Standard 3H-thymidine incorporation and spectrophotometric methods were followed to illustrate mitogenic and melanogenic effects at the cellular level. The resurgence of blue skin, followed by shiny black hair, at the regions of application of the extract demonstrated the reversal of the age-induced prolonged telogenic phase of hair growth to the anagenic phase after topical application of the extract on C57BL/6J mice. Further support was obtained from histology where, at the extract-treated sites, the development of new melanogenic centers and hair follicles was observed. During in vitro studies, the vehicle-free extract constituents stimulated both mitogenesis and melanogenesis of B16F10 mouse melanoma cells in a concentration-dependent manner. The cell morphology and extent of melanogenesis also showed significant changes. In addition, two known melanocyte activity-modulating peptides, endothelin-1 (ET-1) and adrenocorticotropic hormone (ACTH), were determined in the extract, chiefly in the total lipid fraction, indicating their effective cutaneous permeation. The extract was found to be a potent mitogen in the in vitro condition and a potent melanogen in both the in vitro and in vivo situations. This strongly suggests its therapeutic potential for the repigmentation of vitiligo patches.